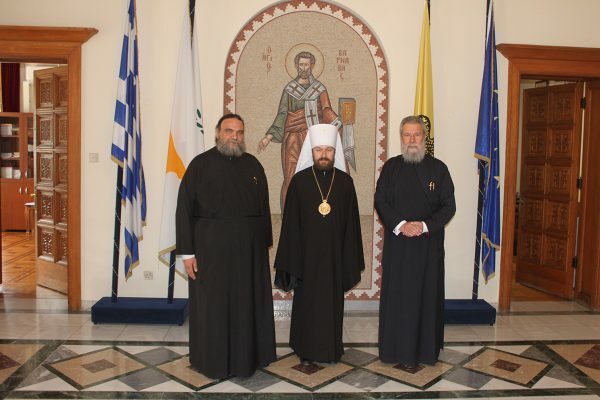 On March 27, 2017, Metropolitan Hilarion of Volokolamsk, head of the Moscow Patriarchate department for external church relations (DECR), met with His Beatitude Chrysostomos II, Archbishop of New Justiniana and All Cyprus, at the Archdiocese of Cyprus in Nicosia. Metropolitan Hilarion conveyed to the Primate of the Orthodox Church of Cyprus warm greetings from His Holiness Patriarch Kirill of Moscow and All Russia. He also thanked His Beatitude Chrysostomos for his pastoral care for numerous Russian-speaking faithful residing in Cyprus, a testimony of which is the opening of a new Russian church dedicated to St. Andrew and All Russian Saints at the town of Episcopi. His Beatitude Chrysostomos, on this part, expressed satisfaction with the state of relations between the Orthodox Churches of Russia and Cyprus, noting that they could be even closer. In particular, he expressed interest in further development of cooperation between the two Churches in the field of education, broadening of students’ exchanges and encouraging Cypriot theologians to make a broader use of studies made by the Russian Orthodox Church on pressing problems of today. Present at the meeting were also Metropolitan Isaiah of Tamassos and Orinis, Archpriest Igor Yakimchuk, DECR secretary for inter-Orthodox relations, and Father Anatoly Churyakov, DECR staff member.